Presidents Day USA coloring pages are a fun way to learn about all of the the US Presidents of the USA. 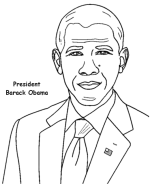 A set of President Barack Obama free printable Presidents Day coloring page sheets are listed below, and remember the "List of Presidents" link back to the other US Presidents coloring pages. Print a set of Presidents Day USA coloring pages to take to your class and play "Name That President Game" to keep the little ones busy learning !